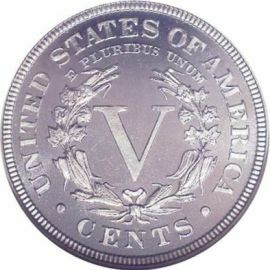 V Nickels - The "Cents" variety! The US Mint produced V Nickels from 1883 to 1913. After the initial error of making these coins without the word "CENTS" on them, the coins enjoyed a thirty year existence at the US Mint. No one could possibly mistake these coins for a half eagle after the change had been made. With the exception of 1912 these coins were exclusively made at the Philadelphia Mint. Denver and San Francisco also produced a limited supply of Liberty Nickels in 1912. The lowest mintage was 238,000 coins made in San Francisco in that year. The obverse of this coin is identical to the "No Cents" variety. 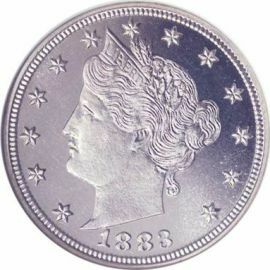 It features a picture of Liberty wearing a crown encircled with thirteen stars. The date is inscribed below Liberty to round out the entire design. "V" in the center. The inscriptions "UNITED STATES OF AMERICA" and "E PLURIBUS UNUM" are above the wreath and "CENTS" is below it.